My roof was in bad shape. I cleaned it and kept after it a few times a year. 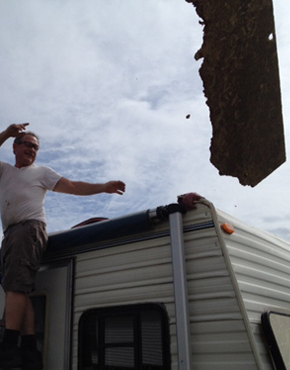 We bought the RV used, and there were signs of neglect when we bought it. It had been obviously sitting in the sun for an extended period of time without any care or maintenance. I was about to buy a sheet of EPDM and forego the labor intensive and very expensive task of replacing the sheet roof. Then I saw a video on Youtube for Liquid EPDM. So the research began. "This looks too good to be true", I thought to myself. But all the videos and customer testimonials couldn't be made up they came from so many different people. So I decided to pull the trigger. Ordered 6 gallons on a Thursday evening. They were at my door Saturday morning. Already impressed by this product/company. So application day came. I used all the tips and answers I found on the outstanding Q&A part of the webpage and put them to use. 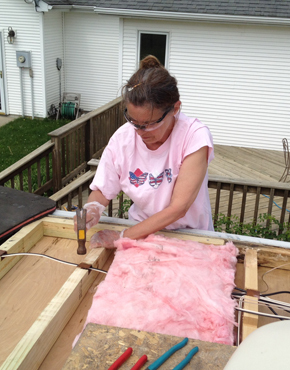 I removed vent covers and cleaned the roof, as directed, with Dawn and bleach (2 cups for every gallon of water). I mixed the 1 gallon first, to "cut in". Mixing took longer than stated, but I'm fine with that. I started at an easy area to get a feel for the product. It brushes on fairly easy for being a thicker product. I used a thin, 4" roller for the areas under the roof rack. Coverage from the 1 gallon did all the edges, under the roof rack, and some of the flat area. Again, mixing the 5 gallon took a lot longer than stated, but again, I'm fine with that. It spreads and rolls out pretty easy. It's been a week now, and there were 2 areas I had concern about. 1 area had some "spider web" type cracking that has gone away with curing just like they said it would. The other area had some air bubbles as soon as it was installed. They popped and left little pits in the coating. It appears now, a week later, that those pits are also dissipating as the roof cures. There is a lot of pollen on the roof, so I'm hoping that washes off easy and everything is good under it. So far, I'm extremely happy with this product. I love the fact you can go right over the edges and vent areas and make it a 1 piece roof. 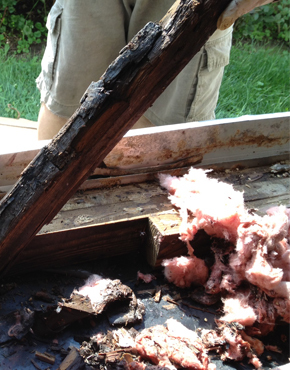 Now you guys need to come up with and easy repair for oxidized fiberglass. when moving to a new section, make sure that section is clean. I used a blow gun as I moved, and still have dirt. if you are doing this in 1 day and don't have a helper to clean tools, buy 2 mixers. even if you don't have a question, read through the q&a section on the website. There are 3 before and after pics, and I uploaded our video. 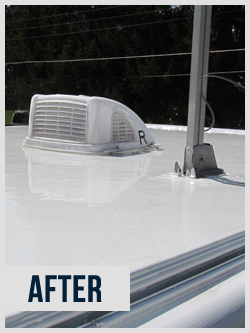 I also want to say that this coating was exceedingly easy to put on and we couldnt be happier. We certainly will be ordering more for do a few touch ups, thanks to the tree above. We actually really enjoyed doing this project and really couldnt be happier with how it turned out. We were thinking of using another option, like from Home Depot and other products that people said worked to just paint over the roof. When we came across your site, we were convinced "do it once, do it right" and it was better than we had hoped. I truely think you all have a great product. I completed my project and it was much easier than I thought, I wish I had done this years ago, and glad I chose this coating versus the other offerings out there. I will send you 2 more emails, this is the start of cleaning, next is primer, the third is the coating. Hope they are worth of a gift card. 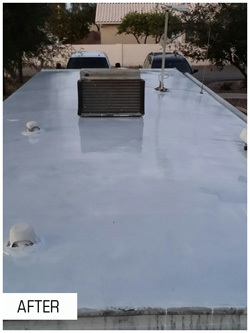 It took me a very long time to make my mind up on what brand coating to purchase for the rubber roof on my 5th wheel RV. 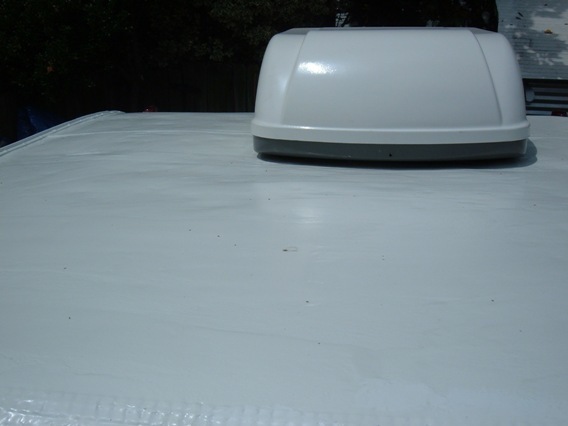 I read lots of replies and talked to other RV'ers who have coated their roofs and finally decided on the EPDM product. I must admit that there were two very difficult steps to the process. 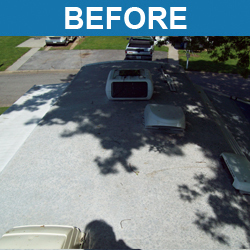 First the roof was so dirty, I had to get on my hands and knees with a stiff scrub brush to get it clean. 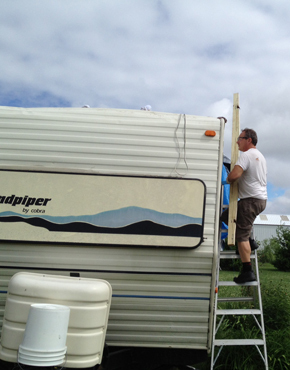 The second difficulty was getting your product from the ground to the roof of the RV. That stuff is very heavy. Application was very easy with the most timing consuming part was going over the edge roll overs after I completed the top flat surfaces. It looks just like new with only a few bubbles left to settle down. This is third trailer I have redone using your product. I am positive that this product is the best on the market! I purchased four gallons a few weeks ago the order came in a few days...and I prepped the roof by pressure washing and scraping loose debris and dirt. Next I wiped it down good with a solution of bleach and water... allowed it to dry and it was time to apply. I hand brushed the edges and vents first...then applied the rest with a paint roller from the front to the back. It cured in a few days and I feel like I made a great decision for keeping the trailer weather proof for many years. Get this old rotten wood out of here !! Look at the floor and wall rott . 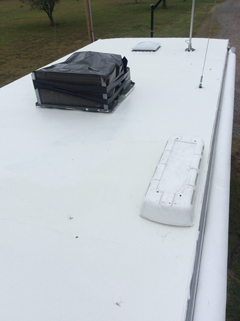 The roof had to leak for at least 15 years , we bought it used in late 2014 , tarped the camper and started the restore in march 2015 After months of hard work , we are finally ready for the your rubber roof ! 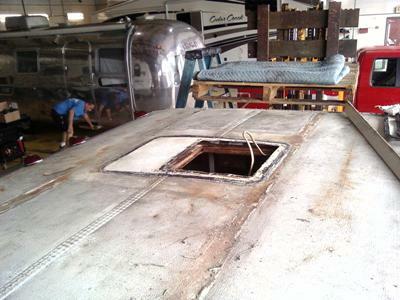 The camper roof wood all replaced, everything after applied with urethane and prepped for the rubber roof. All taping done ! Look at that rubber roof !! Wow . Very easy application very pleased with the results! Now it's just about ready for camping. It was still better to restore the old camper then make $300 payments for 10 years. 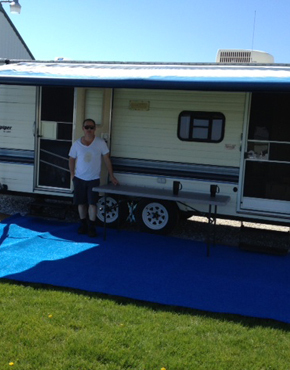 Thank you EPDM Coatings for a great product to seal our camper no more leaks! 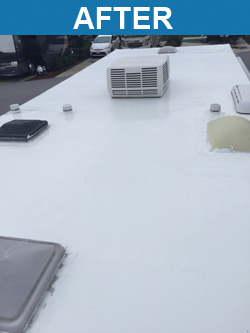 I just wanted to tell you that you sell the best RV roofing product that I have come across in my 60 years. I also would like to tell you that this beautiful spirited lady represented your company with such positive attitude and pleasant voice made my day. She replied to both of my phone calls very fast and answered all my questions. She along with your companies "Liquid Roof" product just make me want to tell all my RV friends (and I plan on telling everyone). Adrian was so nice to me,I called because I bought a 4 gallon pail to coat the EPDM roof on my 5th Wheel RV,I had though that I had a 4-6 hour pot life after mixing--but hear in Arizona I found out that that 4-6 hour is 2-2.5 hours because of the low humidity and warmer outdoor temperature. I ended up only using about 1 gallon before the product became to tacky to spread,so I ended up throwing out about 3 gallons. (my fault). I had called to see if I could save it ,but Adrian was nice and explained that once its gone its gone and it can't be thinned. Anyway,. 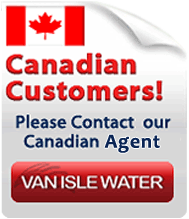 I am still going to use your Great product I will just have to order another 3 gallons. I had a company for over 20 years and I wish I had people like Adrian working for me.She is a terrific person and and a great person representing your company when (Big Dummy's like me) mess up and call. Thanks you for taking the time to read my feedback. 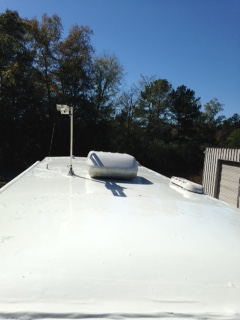 I ordered the RV Liquid Roof to cover the roof on my 28-foot Class C motorhome. 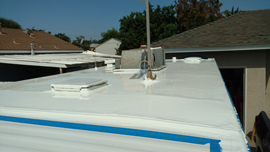 I was not the first owner, the previous owner had done some repairs to the roof but the old sealant used was failing and the roof was starting to leak. I took advantage of a nicer day this winter and cleaned and coated the roof. Applying it was really easy, I would pour some on the roof, then use a roller to move the coating by building a "wave" ahead of the roller to push the coating into the places I wanted "a little extra" coating, then rolled the rest out from that. 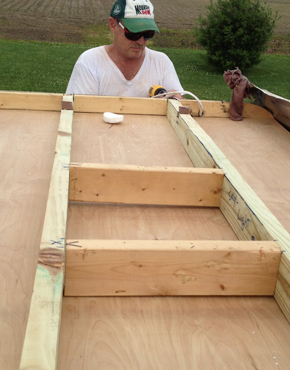 To get the edges, I simply rolled the coating to the edge and "just over" onto the edge of the rain cap. A couple of hours of work, and I was done. Its been cooler here but one thing I have noticed in addition to no leaks from the roof - our furnace is not running as often! Previously it would turn on 3-4 times per hour, now it turns on 2-3 times per hour. Not a huge change but it helps our propane last longer! I would not say that this is a miracle coating, but it comes close! My roof was really deteriorated. However it was not leaking yet. Your product was just what I needed to make it last a few more years. Easy to apply and a great alternative to a total replacement. 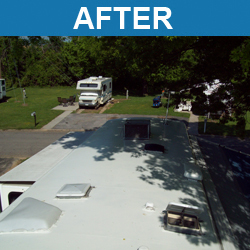 Hi epdm coatings I wanted to send the attached pictures of my camper before and after application of you liquid RV Roof. I put it on last week and it looks great. I was a little nervous putting it on at first but it went very smoothly as i got a feel for it. I sanded the tape that i had applied at a few locations and put contact cement on it as you advised. The camper looks great and i could not be more pleased. It did bubble up in a few places at first but they have pretty much gone back down now. I will be sure to let anyone i know who has a camper about your product. Product worked exactly like your company said it would! 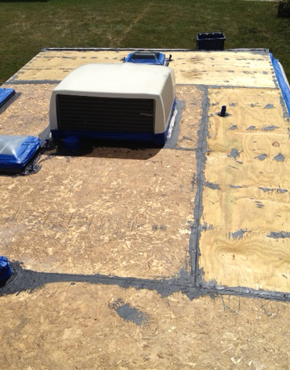 We had some bad spots on our roof, and cannot spare the time or money for a total skin replacement and it is structurally sound after the intensive interior reconstruction I did a couple of years ago)--- when the installation guys were putting the new ac on, several times, they walked on my roof. It made me nervous as heck, but it held them very well. They patched with some areas as seen, with DiSeal Tape. As I would have loved to have read about someone doing this to a Scotty specifically, before doing it myself, I though it'd be good to document it here to let people know how our roof coating session went. I wanna say that it appears thusfar, the day after, cooler, WAY more waterproof (though tonight we get the test), cleaner, newer, and way better looking too. People use this stuff to coat roofs of all kinds, including, to line ponds, it holds it's seal under water, also used on boats, is flexible and well know how Scotty skin flexes and puts finishes to the test, whilst traveling... so I figured what better thing to put and end to any questions about leaks. To let anyone reading this know, a while back, we have taken off the side railing on both sides, wire brushed out the old caulking, put new butyl rubber tape on and reapplied them... and the awning holder thingy too. Before that, I had taken the front and rear seals, The one along the lights line, and resealed them with butyl tape too, stainless screws... So that part was done. Additionally, the roof yesterday was so hot you could barely touch it. Today when I first tested it's stickiness, it is actually cool to the touch: this is a beach camping machine, so our reasoning for coating it is many fold: the intense sun heats it up like an oven, so it was to keep it cool while camping, and at night, on a barrier Island like Hatteras, at night, the salt that is in the air combines with humidity dropping to form a salt like dew that falls and coats everything, including but not limited to that galvanized (methinks) roofing. 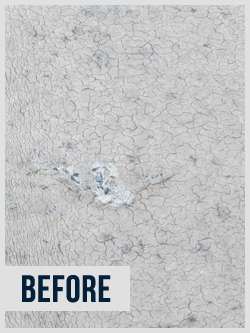 There were a bit of degraded spots needing attention, and the coating was our solution to the issue. There were very heavy storms coming in the morning for dose number one, the evening for the heavier dose... the next morn we awoke, went out there went inside, and I felt like crying! Completely dry! Water beading on the roof! Blow on it, and it just rolls right off. I even got approval from my brother who had said a few times, we should just buy something new, and camper group members who have said it looks from the pics alone, tons better than thin multi-coat "other" roofing stuff- along with a lot of inquiries about where to purchase it, I am sending them straight to the site, though online retailers' review are worth reading too, and they are incredible. Suddenly, I am looking at a camper we can work with instead of one that beforehand had a morbid look to it. All I could think about was the leaking coming from the roof. Now it's time for some sanding and painting of the sides, which I cannot wait for, and thanks to EPDM's incredible product, we will soon have a camper that everyone sees riding down the road, and takes pics of! Thank YOU for coming to our rescue with an incredible product, it couldn't have been any other coating that would have given us such hope for something vintage we've owned for 21 years! I thought this product was pricey but it really met my expectations. 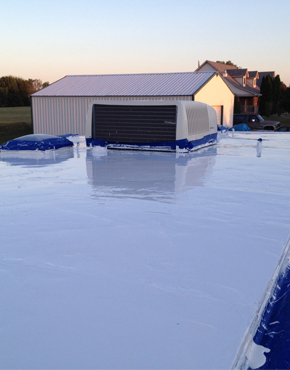 Creates a really tough, shiny membrane that seems way better than the cheaper roof coatings. My only complaint would be that it would be nice to have an easier way to use less than the whole batch at once. Still, one 5 gal container was more than enough to coat my 32 foot motor home and then go onto to additional areas on another older RV I own. So far, it seems to live up to the billing. I used this product on my 1998 34' RV and it worked like a charm. I ordered a 4 gallon pail but it comes in a 5-gallon container so there is ample room to mix the catalyst. 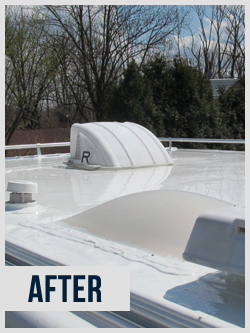 I spent one day cleaning the roof with a pressure washer and then applied the Liquid Roof the next day. Tools I used were a long-handled, short napped roller (for the large flat areas) and a decent 4" paint brush for the sloped sides and around the vents. 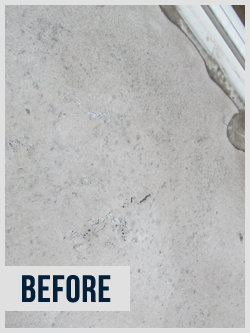 Product cleans up with Xylene or mineral spirits well. Don't use a cheap brush because the hairs will come out making them a pain to remove. Remove any masking tape as soon as your done makes the job easier as well. Hint: I poured out two gallons initially for use and refrigerated the rest. 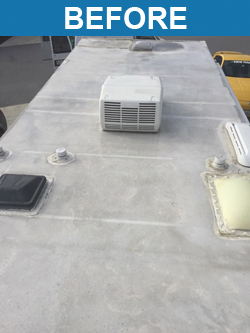 As long as you store it under 55 degrees, it will not set-up My RV roof looks brand new and I couldn't be happier.Took about 3-4 hours to complete. 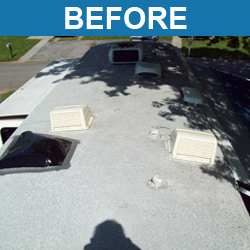 Dealer wanted $1800 to do this job which was very easy for a do-it-yourself person. My '95 22foot Terry trailer has been sitting unused in the southern California sun for 5 years. 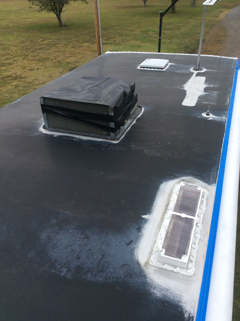 When I decided to start camping again and was cleaning it up for the road, I noticed that the rubber roof membrane was in serious need of replacement. No one would even talk to me about repairing the roof for under $3000.00. Hell, the trailer isn't worth that much. 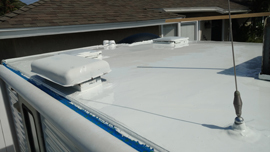 I did a lot of research and read about epdmcoatings and the "LIQUID ROOF" product they sell. 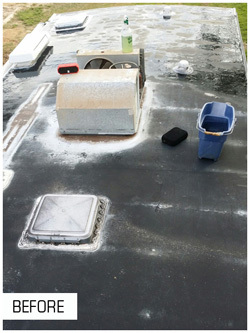 I prepped the roof and removed the old AC cover and vent cover for the refrigerator and methodically cleaned the old (now black as a tire) roof membrane with mild detergent and a Scrubbie pad. In the process I was covered with BLACK RUBBER yuck as was the sides of the trailer and the driveway. These all cleaned up fine later on with a pressure washer and some elbow grease. 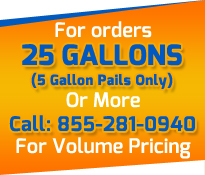 I ordered a full 5 gallons of Liquid Roof to make sure I had enough. I followed the instructions on the label. I had watched a number of YouTube videos on applying the product and had a friend help me. I mixed the product using a heavy duty 1/2 inch electric drill (don't try using a battery drill) at 6AM. I let the product sit for an hour. We began applying the product about 7:30AM. The forecast was for 100 degree plus day so we wanted to work in the cooler part of the day. We finished the application and the clean up by 8:30. I had just enough to do my roof and was glad I purchased 5 gallons. I left the roof alone for a week to set in the sun with no rain. There was a little dew on a few mornings but that didn't seem to matter. 24 hours after the application I climbed up the ladder to see how it looked and was horrified at what I saw. The roof had become all wrinkled and uneven. I am glad that I had done my research because this was mentioned in YouTube videos as well as on line blogs and is normal. 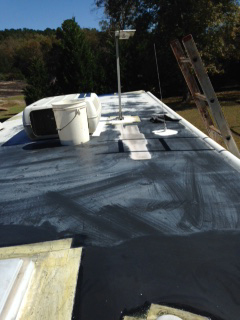 It is too be expected and smooth’s out as the roof product melds into the old roof membrane. I just returned from a three week vacation to Oregon and the roof is the best looking part of my trailer. 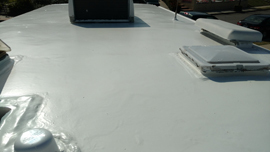 Liquid Roof preformed well beyond my expectations.It is a great product that someone with patience and ability to follow instructions can apply themselves. It is very messy and I planned ahead with grubby clothes I could throw away, lots of disposable cloth rags, paint thinner and the brushes, pans, rollers and buckets I used were ones I planned to just toss after. I have recommended this product to all the RV people I meet. It saved my trailer, has given me another 5+ years of probable use out of it and Liquid Roof mostly saved my bank account. It is an EXCELLENT value. I purchased and installed this last summer on my trailer. Came back to coat another unit and bought more. It has been on for a year now and after cleaning the roof it still looks great. I expect this to last for the rest of the life of my trailer. 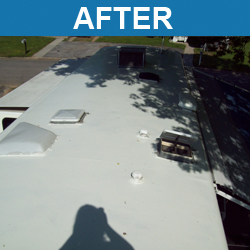 I would recommend this to anyone who is looking to restore the roof on their RV. 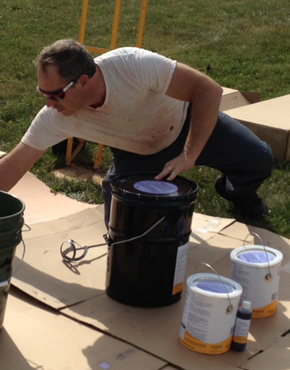 © Copyright 2014 EPDM Coatings LLC. All Rights Reserved.